Big Idea: Understand how to use perspective in artwork. Planning: Sketches or outline of the proposed project with all important details worked out. Get approval before starting final artwork. Task: Select a type of perspective, then create art using it in the media of your choice. Linear, or one point perspective is used by artists to make realistic three dimensional spaces on two dimensional surfaces, like your drawing paper. The ability of artists to do this was an important development in art history. 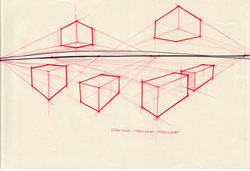 Two point perspective is different from one point perspective. Here are steps to draw simple buildings. Here are some examples of how artists use two point perspective. Forced perspective is the compression of depth by arranging objects to create an illusion. Like here and here. Honda Illusions and behind the scenes. Atmospheric, or aerial, perspective is about using knowledge of how scale and color are affected by distance to create depth in landscape art. Read more here. My examples.